Baton Rouge, Louisiana – Wednesday, November 1, 2017 – Lamar Advertising Company (Nasdaq: LAMR) today announced that Sean Reilly, CEO of Lamar Advertising Company, is scheduled to participate in a question-and-answer session at the Wells Fargo Securities Media & Telecom Conference in New York City, NY on Wednesday, November 8, 2017 at approximately 9:20 a.m. (ET). Founded in 1902, Lamar Advertising Company is one of the largest outdoor advertising companies in North America, with more than 330,000 displays across the United States, Canada and Puerto Rico. Lamar offers advertisers a variety of billboard, interstate logo and transit advertising formats, helping both local businesses and national brands reach broad audiences every day. In addition to its more traditional out-of-home inventory, Lamar is proud to offer its customers the largest network of digital billboards in the United States with over 2,600 displays. Please feel free to explore our website www.lamar.com or contact us for additional information. Lamar Advertising Company (Nasdaq: “LAMR”) will release its third quarter ended September 30, 2017 earnings report before the market opens Monday, November 6, 2017. 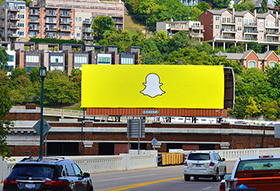 Out of home advertising by Facebook and Snapchat? Recently, the out of home industry has been bolstered by major investments from a sector that many may not expect—technology.